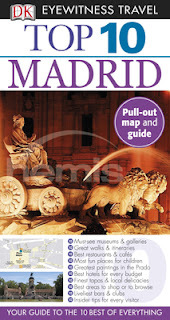 Our Madrid experience began at 0300 Dallas-time and our first stop was the Tourist Info kiosk where we were to pick up our pre-purchased train passes. Spotting the Tourist Info booth was not a problem as Madrid's Barajas Airport is largely constructed of walls made of clear glass. The problem was in actually getting there. After riding the glass elevator to nowhere a few times, we eventually changed our strategy by using the escalator. Travel tip: When in Madrid's Airport...consider using the escalators. The elevators bypass certain floors. We weren't quite certain of what we ordered but we think it was ham. FYI: Our tour of Madrid did not include attending a bullfight. When you are going someplace that you know very little about and have a limited amount of time at your disposal, pick up an "DK Eyewitness Top Ten" guide to help you navigate your trip before you go. They're inexpensive, little handbooks that include train, city and road maps, points of interest with corresponding addresses, opening and closing times. There are a ton of things to see in Paris, the 'Top Ten' guide gives you a list of the 'Top Ten' Paris highlights. Let's say 'The Louvre' is listed in the 'Top Ten" Paris highlights. This is where the dirt meets the road. There are tons of things to see in 'The Louvre', so the 'Top Ten' guide then gives you a suggested listed list of the 'Top Ten' works of art within 'The Louvre'. I am not being compensated for my DK Top Ten endorsement...I just really like them.